SiteVista recently launched a new email testing service that will help you to be sure your emails appear correctly. The tool is very similar to Browsercam in that it will let you see rendered versions of your message as it would appear in AOL, Gmail, Hotmail and Outlook. They will be adding other email clients over the next few weeks, such as: Yahoo! Mail, Outlook Express, Eudora, Lotus Notes, Thunderbird, Windows Live Mail, Apple Mail, and Entourage. It works by you sending an HTML email to the address they provide. For every email you send, you receive two screen captures. One of the email as it is displayed in the software’s preview pane, and one showing you the entire message once it’s been opened. Anyone dealing with email newsletters on a regular basis will know how time-consuming testing can be - if you're spending more than a couple of hours a month on it, SiteVista may well prove to be just the solution you've been looking for. When considering how important deliverability is to an email marketer's overall success, the adage "Showing up is half the battle" comes to mind. Simply put, you cannot take your delivery rate for granted because each ISP has its own rules when it comes to bounces. In fact, according to data from MarketingSherpa’s latest Email Marketing Benchmark Guide, 25% of business-to-consumer marketers surveyed said they’ve seen a significant increase in bounce rates. MarketingSherpa is seeking nominations for its second annual Email Marketing Awards. Ten entry categories include: best email newsletter, best email solo blast promotion, best triggered campaign, best opt-in (list growth) campaign, and best business-to-business email marketing. The deadline for entries is February 16. Get $50 off the regular entry fee with code EA33. Winners will be announced at a lavish Awards Gala to be held at Bongos Cuban Café (owned by Gloria Estefan) in Miami, Florida on March 5th, in conjunction with MarketingSherpa's Email Marketing Summit & Expo. In this article, Silverpop's Bill Nussey offers some tactics and strategies to move your email marketing campaigns from marketer-centric messaging to customer-centric messaging. Enabling a two-way flow of actionable information between your email and website analytics applications will allow you to target and trigger email campaigns based on website click-stream data more efficiently-- these are the details of how someone interacts with your website. For instance, if you know an email customer is conducting product-specific searches or browsing particular pages or areas of your website, you could follow up with an email message that includes product information and incentives related to those products or categories. Lifecycle automation adds another dimension to targeting-- time. Rather than assuming that every recipient wants to receive a message at the same time, lifecycle automation times each message so that each recipient gets a message when it's most appropriate. Some examples include welcome, subscription renewal or product replenishment messages. If you're a marketer and are looking for a resource to network with other email marketers and learn about best practices, the Email Marketing Roundtable is definitely the place to be! It's a a nonprofit group where online marketers and e-commerce specialists can meet and talk about what works and what doesn't in the day-to-day world of email marketing. I've been a member of this group for more than a year now, and the value and knowledge that I got out of it has just been amazing! Spread the word! How Does Sender ID Framework Work? 1. Sender sends an e-mail to Receiver. 2. Receiver’s inbound e-mail server receives e-mail and calls its Sender ID Framework. 3. The Sender ID Framework looks up the SPF record of the domain that Sender is using for sending the mail. 4. The receiving Mail Transfer Agent (MTA) determines if the outbound Mail Server IP address matches IP addresses that are authorized to send mail for the user. This four-step wizard will guide you through the process of creating a new SPF record for your DNS domain. Spam is back with a vengeance and the effect on ISPs and other email access providers is substantial, requiring ever-growing resources just to avoid drowning in the flood. In response, ISPs are doing what they've always done: tightening delivery requirements. The good news for email marketers is the use of image spam and extreme variations in content mean that content filtering is less of a focus. The bad news is list hygiene and other chores related to best practices are becoming much more onerous. In particular, ISPs are increasingly aggressive about bounce rates. There's a clear correlation between high bounce rates and spam, so it's understandable ISPs utilize this as part of their defense. This means marketers must now remain within the bounce rate requirements at all times, making older list cleanup much more difficult. In recent months, some ISPs have become so aggressive about bounce rates that even legitimate communications preferences are no longer tenable. Unless and until ISPs realize they've tightened requirements so far that some classes of legitimate email simply can't be delivered within the parameters they've set, it will be very difficult to resolve this issue. Email list pricing for both b-to-b and consumer lists continue to decrease, according to list manager Worldata in its Worldata List Price Index. B-to-b permission-based email lists commanded an average price of $273/M this month, a 1.4% decrease compared with January 2006. Worldata said the decreased pricing in the b-to-b email category reflects growth in the number of lists available. B-to-b e-mail lists were the highest-priced category among all lists, including business catalogs, business magazines, databases and attendee/membership lists, with newsletter lists a distant second. Newsletter lists commanded an average $172/M, a decrease of 3.4% from last year. CampaignMonitor's Mark Wyner tested CSS support in two new webmail clients: Yahoo Mail Beta and Windows Live Mail. The results are a nice blend of excellence and incompetence: Yahoo is leading the way with their support of CSS and web standards, while Microsoft has once again proven they are falling behind. Read all about CSS support for Windows Live Mail and Yahoo Mail Beta here. A new survey from the Email Experience Council’s List Growth & Engagement Roundtable shows that only two out of five marketers know their cost to acquire an email address. How much can I pay for a new subscriber? How much revenue can I expect a new subscriber in a specific demographic or from a particular source to contribute? When segments of subscribers are below the optimal ROI, what different types of content or frequency will boost their engagement? Acquisition marketers typically know the amount they are willing to pay for a search keyword. Email marketers want and need that same level of confidence when they plan their list growth, acquisition programs, content strategy and promotion calendars. Return Path has just released their Third Annual Holiday Email Consumer Survey. For the third year in a row, consumers say that they love the kind of email that helps them shop, gives them new ideas and comes when it was promised (and not more often). The good news is that nearly all respondents selected at least one response indicating the importance of email to their online shopping this season. In fact, half (49.1%) claimed they took advantage of several email offers this year. But the bad news, at least for some marketers, is that half report receiving high volumes of "junk" email this year (“email from companies I know but that is just not interesting to me.”), and one-third say marketers email them more frequently than promised. What makes consumers open one email and not another? Today I received a phishing email disguised as an eBay promotion. If it hadn't arrived in a mailbox that I never used to sign up for eBay (that was clue #1), I would definitely have fallen for their trap. Even though I have been reading about this type of spam/phishing emails in the last couple of weeks, I was shocked to see how good these guys are in conceiving people! I've seen phishing emails before, but the scary thing about this one is that these spammers were mimicking an actual eBay email in which an actual price promotion was announced. Read more about this phenomenon here. In this article Melinda Krueger explains how to build and send Multipart MIME messages. A multipart MIME message is like a package with multiple boxes within it. In your standard HTML + text message, both types of content are sent in the email. Your email client, assuming it understands MIME format, will decide which of the boxes to open and display to you. It is up to the mail client to determine which content type to display or how to convert the content and format it for its own display (a la mobile devices). It’s also important to note that there is no standard stating that a message must contain either format or that if they do, each part must contain the same content. In this article Campaign Monitors' Matthew Patterson explains what open rates are all about. So a 20% open rate would mean that of every 10 emails delivered to the inbox, 2 were actually opened. How do you measure an open? When each email is sent out, automatically a piece of code is added that requests a tiny, invisible image from the sender's web servers. So when a reader opens the email, the image is downloaded, and that download is recorded as an open for that specific email. It is important to understand that the open rate is not a 100% accurate measure. Recording an 'open' can only happen if the readers email client is capable of displaying html with images, and that option is turned on. So if you are sending text-only emails, there is no way to record open rates (the exception is if they actually click a link). Similarly, people reading your html email without images showing will not be recorded as opens. Another issue is that your readers may have a preview pane in their email client. That preview pane might be displaying your email automatically (and therefore downloading the images) without the reader ever having to click on it or read it. So you should never take your open rate as a hard and fast number, because you can never know the true figure. It is much better used as general guide, and as a way of measuring the trends on your email campaigns. As the first article in a series of in-depth best practice articles, Spencer Kollas discusses the first thing you have to do to be successful in email marketing: capture data. Starting with data capture is fitting, as it sets the stage for future deliverability. The way in which you capture your customers' data is critical. It marks the beginning of a customer relationship that will evolve over time. At this initial interaction with the customer, you need to collect critical data reliably so you can create rules of engagement for all future communications. When identifying which data to capture, you should consider the value exchange (i.e. what you'll be offering the customer in return). For optimal results, you should try to keep the two sides equal. If you ask for too much data, you risk having the customer abandon the form. On the flip side, you don't want to overlook data that you'll need in order to provide the service. It's also a good idea to test the optimal amount of data to be collected. And don't ask for information that you won't or can't use, as that can reflect poorly on your organization in the long run. Many senders wonder what action steps they can take to help in the fight against spam. Well, Spamhaus launched a new Policy Block List that is intended to be a compendium of legitimate IP addresses. Want to help the global fight on zombies and botnets? Join the list. The Spamhaus PBL is pretty simple. Network managers will be able to self-specify those IP ranges under their control that are supposed to be sending email (their own servers, and, in the case of service providers, their customers'), and all other IPs will be considered to be sources of illegitimate mail -- a zombie on a home computer, for example. If you do not control your own IP addresses, encourage whoever does (your email service provider or other vendor) to provide their data to the PBL. Email marketing still apparently has a long way to go in terms of integration and analysis. Sixty-five percent of marketers surveyed said they don't integrate email with their other sales channels,according to a survey released last week by marketing software provider Alterian. Most respondents said that the biggest obstacle to integration is that online and offline marketing activities are managed by separate departments. Also, 70% of respondents said they applied basic or no analysis to any of their email campaigns. However, 81% of the 540 marketers in North America and the U.K. surveyed said they plan to boost their spending on email this year, whereas 51% said they plan to increase their offline direct marketing spending in 2007. And 94% of the respondents who said they will decrease offline marketing spending this year intend to increase online marketing spending. Meanwhile, 44% of the marketers surveyed said they manage their email programs inhouse, 29% said they outsource to email service providers, 15% said they send the work to agencies, and 11% said they use marketing service providers. Seventy-one percent of the marketers surveyed said they send fewer than 1 million emails a month. If you do business online, there are times when you send your customers, prospects and subscribers an email or two. The emails you send tend to fall within one of three categories. 1. 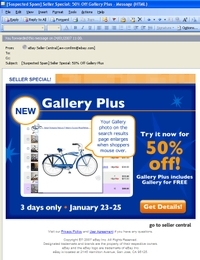 Promotional emails with which you attempt to make a sale. 2. Acknowledgement emails which are sent out automatically in response to some action taken by someone on your site. For example, when someone makes a purchase. 3. Customer service emails which are sent out in response to an inquiry, question or complaint sent in by someone from your site, or through email by someone who has made a recent purchase. In this article, Stefan Pollard explains how bad feedback management can affect email deliverability. He also says not to stop with just processing comments, complaints, and questions that arrive in response to a mailing, purchase, or some other interaction. You should also be out in front of your subscribers or customers, soliciting comments with regular surveys and with prominently displayed requests in newsletters, solo offers, transactional email, and Web links. When you seek out comments, you unearth valuable information that not only helps your marketing goals but also spotlights dissatisfactions that can potentially affect deliverability.